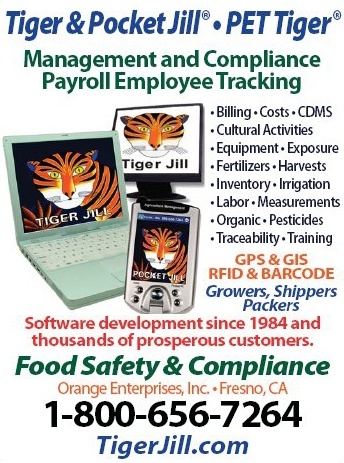 BusinessSmart Tiger Jill™ is the premier software program designed to record all field, site or structure Applications, Expenses, Measurements, Cultural activities, Labor, Equipment, Inventories, Billing, Scheduling, Planning, Budgeting, Mapping, Food Safety, Employee Safety, Chemical Reporting, Worker Protection Standard, Hazardous Manifest, Recommendation, Management Capabilities and more. Tiger Jill™ is loaded with program functions designed to increase productivity, efficiency, compliance and profit. Management variables like: Caretaking, Budgets, Expenses, Inventory, Purchasing, Yield, Personnel, Equipment, Maintenance, Chemical & Fertilizer Applications, Weather Data, Recommendation, Reporting, Work Order, Billing, Receiving, Commission, Safety, Food Safety, Regulatory Compliance and Connectivity are only a part of what Tiger Jill™ can contribute to your operation. Tiger Jill™ will provide you with a competitive edge to better manage your operation and will assist you in growth, productivity and prosperity. Tiger Jill™ equipped with the connectivity feature facilitates the electronic data exchange between different users. Tiger Jill™ data transfer via an Internet or Intranet connection ensures that all information is protected at all times. Tiger Jill™ is easy to update 24 hours a day, 7 days a week from within itself using your internet connection. This provides you the opportunity to always have the latest and greatest innovations of the program available. You can use this feature to automatically download the latest program, reports, help and database directly from our website. We recommend you update your program once a month unless otherwise advised by Orange Enterprises. Record and track measurements like soil analysis, crop condition, trap counts etc. What are the benefits of using Tiger Jill™? Tiger Jill™ allows you to take your records into the field and via wireless connection stay in touch with the office.